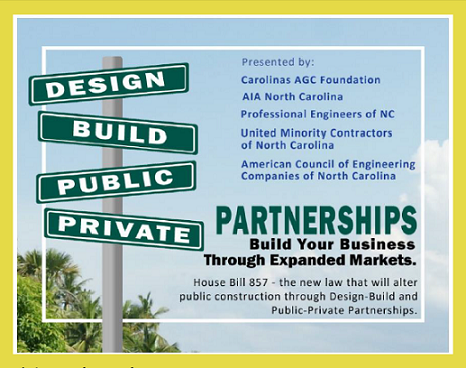 This past summer, the N.C. General Assembly passed and Governor McCrory signed into law groundbreaking legislation authorizing the use of design-build, design-build bridging and public-private partnerships in the delivery and financing of public construction projects in the state. The legislation is sure to alter North Carolina’s public procurement landscape drastically and influence the complexion of the state’s construction industry, particularly at the design and prime contractor levels. 1. The Time Had Come To Act. In recent years, public owners had been clamoring for greater flexibility in the procurement of public construction projects, and the General Assembly had dealt with an explosion of local bills to conduct one-off design-build (“D-B”) jobs. These bills, however, were not consistent with each other, and no legislative guidance existed with respect to how local awarding authorities should procure and administer their unique D-B projects. HB 857 changes that, creating uniform rules-of-the-road for public D-B projects across the State. Meanwhile, out-of-state groups had been lobbying for increased use of public-private partnerships (“P3s”) in the financing of public construction. As Dave Crawford, Executive Director Vice President of AIA North Carolina, said last week, it was important for the State to ‘get ahead of the wave’ by crafting P3 legislation that was fair to all interested stakeholders. 2. Design-Build and Design-Build Bridging Are Now Expressly Permitted In the Procurement of North Carolina Public Construction Contracts. These two project delivery systems join multi-prime, single-prime, dual bidding and construction management at risk as legislatively sanctioned procurement methods for North Carolina public construction projects. D-B contracts offer one-stop shopping to an owner, who enters into a single contract for both the design and construction of a project. The theory is that alignment of design and construction functions will generate collaboration, cost savings, single-source accountability and shorter project durations, although the owner loses the independent advice, input and recommendations of the architect/engineer (“A/E”) in the process. Design-build bridging might offer a solution to this downside of pure D-B. As contemplated by HB 857, the bridging method requires the owner to select a separate A/E to prepare 35% construction documents and serve as the owner’s representative throughout the subsequent procurement, design and construction phases of the project. The bridging method under HB 857 also requires some competitive bidding on the construction side of the project team, as discussed in paragraph #5, below. in the case of D-B bridging, the 35% construction documents. On pure D-B procurements, public owners must solicit at least three responses, evaluate the competence of each responding D-B candidate, rank each D-B team and then negotiate a contract at a “fair and reasonable fee” with the highest ranked candidate. Such Quality-Based Selection (“QBS”) is not new to North Carolina pubic contracting: it has long been the law of the land for the procurement of architectural, engineering, surveying and construction management at-risk contracts under N.C. Gen. Stat. § 143-64.31 (sometimes referred to as N.C.’s “Mini-Brooks Act”), which HB 857 revamps. For a primer on QBS and the Mini-Brooks Act, see this very handy blog post by Norma Houston of the UNC School of Government. NOVEMBER 13, 2013 CLARIFICATION: Note that under D-B bridging, as opposed to pure D-B, the governmental entity must group the three highest-ranked teams together, but NOT assign a ranking to those three “finalists” as against each other. Instead, the governmental body must award the contract to the lowest responsive, responsible D-B team from that group of three. The “lowest” price is based on the cumulative amount of general conditions costs, design services fees and construction services fees provided by each bidder in a sealed envelope submitted along with each D-B team’s proposal response. In a nutshell, then, the procurement process for the D-B bridging project delivery system represents a hybrid between QBS and hard-bid contracting. 4. Design-Builders Have Two Choices for Project Team Selection. D-B candidates must provide with their responses either a list of the licensed contractors, licensed subcontractors and licensed design professionals whom the design-builder proposes to use for the design and construction of the project or, alternatively, outline a strategy for open contractor and subcontractor selection under the hard-bid statutes (i.e., N.C. Gen. Stat. § 143-128 et seq.). These two options should promote flexibility in the recruitment of the project team and open the door to the possibility of competitive bidding in the selection of the construction side of the team, even when the owner procures the project through pure D-B. 5. Project Team Selection Under the Design-Build Bridging Method Requires Some Competitive Bidding. Specifically, the design-builder must solicit bids from all first-tier subcontractors under the hard-bid statutes, satisfying a desire shared by many industry stakeholders for some competitive bidding in the selection of the construction side of the D-B team. Effectively, the design-builder under the D-B bridging method must procure first-tier subcontractor services in the same manner that an owner contracting via multi-prime would procure prime contracting services. 6. Public-Private Partnerships Are Now Expressly Permitted in the Financing of Public Construction Projects. HB 857 allows public owners to enter into contracts with private developers to acquire, construct, own, lease and/or operate a public construction project. Such contracts must specify the property interests of the governmental entity and all other project participants, the responsibilities of the governmental entity and all other project participants with respect to both project development and financing, and the responsibilities of the parties to put forth a good faith effort to recruit minority-owned, women-owned and small business entities in the completion of the project. 7. HB 857 Seeks to Ensure a Transparent & Competitive P3 Tendering Process. In an earlier blog post, I raised concerns about private developers tendering unsolicited proposals to public entities if P3s were permitted in North Carolina. Such unsolicited proposals tend to compromise transparency in the procurement process and inhibit competition in the design and construction of a P3 facility. HB 857 takes a number of steps to avoid these problems. First, it requires a public body seeking to finance a project via a P3 to set forth in writing its “critical need” for the particular capital improvement and then subject that “critical need” to scrutiny during an open public meeting. Second, the bill mandates that the public owner determine its programming requirements for the facility in question, determine the form in which private developers must submit their qualifications, and then publicly advertise its solicitation for qualifications. Third, it requires that the private developer provide at least 50% of the financing for the total cost necessary to deliver the capital improvement, ensuring the developer has “skin in the game.” Fourth, the private developer may self-perform a portion of the design and/or construction work only if a previously engaged contractor defaults and a qualified replacement cannot be obtained. 8. 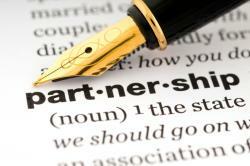 Bonds Are Required for Design-Build, Design-Build Bridging and P3 Projects. Both performance and payment bonds are required for pure D-B and bridging projects in accordance with the existing Model Payment and Performance Bond Statute (i.e., N.C. Gen. Stat. § 44A-25 et seq.). Performance bonds are optional on P3s, but the private developer must furnish a payment bond equal to 100% of the total anticipated amount of the construction contract(s) to be entered into between the developer and the construction contractor(s). This requirement is intended to ensure payment protection for subs and suppliers on P3s, which I had considered a “must” in my previous blog post on the subject, but I wonder how private developers will be able to obtain the required bonding capacity. 9. The State Intends to Monitor the Efficacy of Alternative Project Delivery. The Department of Administration, through its State Construction Office, clearly intends to keep an eye on the utilization of construction management at-risk (CM@R), pure D-B, D-B bridging and P3s going forward. Public entities utilizing any of these alternative project delivery systems are now required to report to the State a detailed explanation why the particular system was used in lieu of the multi-prime, single-prime and dual-prime methods of public procurement, including the benefits the public body anticipates realizing from usage of its chosen method. These reports must be submitted within 12 months of beneficial occupancy, and a public agency’s failure to timely report entitles any person or entity to sue to enjoin the agency from continuing with the project in question and/or from using alternative project delivery as the basis for contracting on any other project. 10. A Study Committee is Reviewing Contractor Prequalification. I’ve heard a number of clients and industry representatives express their concern about a lack of objectivity in the contractor prequalification process for public construction projects in North Carolina, particularly on CM@R projects. The General Assembly apparently shares that concern, as it has appointed a study committee to analyze existing prequalification procedures on non-transportation public projects and to develop “one or more objective and nondiscriminatory systems for prequalification to permit all appropriately licensed North Carolina general contractors to have the opportunity to bid in open competition for public construction projects in the State.” The committee is composed of various legislators and construction industry stakeholders, and its report is due before the 2014 legislative short session is convened next May. HB 857 represents a sea-change in North Carolina public procurement, and this top ten list merely scratches the surface. Let’s keep the conversation going. What’s your reaction to the legislation? As always, comments and questions are welcome. As a senior architect and more importantly a concerned tax payer this is good in theory only and does not considder the nature of man and especially in the political governmental world; in other words the profit motive , greed and corruption. There must be system of checks and balance that only the traditional bid system has and even then deception and corruption goes on in public government construction.